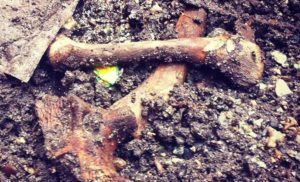 Composting bones: Can I (and should I) put bones in my bokashi bucket? A common question we get asked is: Can I put bones in my bokashi composter? This is really two questions about composting bones: can I? and should I? The first is easy…. the latter is not so black and white. Can I put bones in my bokashi composter? See, told you that was easy! The bokashi composter will help remove pathogens associated with composting meat bones. The fermenting process of bokashi composting will mean that the bones are not attractive to pests. So, yes, you can put bones in your bokashi composter. They will break down in your garden soil, eventually. Should I put bones in my bokashi composter? It depends! Bones take a long time to break down, even after they have been through the bokashi composter. If you are happy digging bones up from your garden then, go ahead, throw your bones into your bokashi composter. Personally, I love the ease of putting absolutely everything into my bokashi composter. So, I do throw all of my bones into the bokashi composter; chicken carcasses, rib bones… everything. I know where I have buried the bokashi pre-compost in my garden as I will still dig up bones months later! I know some people who use the bokashi system almost exclusively for meat and bones. For example, if you have a successful vermicompost or hot-composting pile you may be able to compost most of your food waste that way. The bokashi composter allows you to compost those harder-to-compost items such as bones. Similarly, those of you using bokashi compost to strive for zero waste will likely want to put your bones into your bokashi composter too. However, if you want to have fine soil in your garden or you will be sieving the compost pile, then you likely shouldn’t add your bones to your bokashi composter. Likewise, some people don’t like the idea of finding animal bones in their garden beds. It really is up to you. There are a few techniques that you can use to help your bones break down more rapidly in your bokashi kitchen composter. Boiling your bones to make broth will help soften the bones. These softer bones will break down a bit faster when you add your bokashi pre-compost to your garden. Using a meat grinder it is possible to grind smaller bones. Or you could smash them with a hammer before adding to your bokashi bucket. Like chopping your food waste, smashing or grinding your bones allows the bokashi microbes to get at a larger surface area. Ground or smashed bones will break down into compost faster. Alternatively, you could wait until your bones have been through the bokashi process and been in the soil for a while before your smash them. By that time they will have become more brittle and easier to break. It really is a personal preference and depends on what you want to get out of bokashi composting. Bones in or bones out…. its up to you! 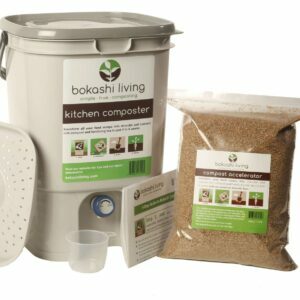 What’s best to put in your bokashi composter? I switched to bokashi composting a year ago when I moved up to the Yukon. One, there are no worms, so it seemed a good idea. Two, it’s wild animal country, so great (I thought) for bones. The trouble is, my dogs are scent hounds, so forget about a 12-inch dig! After a year, not only have they dug up every bone, but also every coffee filter, avocado peel, corn husk, egg shell, and pretty much anything else still recognizable. The good news is, it wasn’t bears who did the digging. But from now on, the bones will go straight to the dogs. And I’ll put the rest of the bokashi pre-compost in a plastic animal-proof composter and hope for the best. Maybe I’ll post the results next year. This is good to know because I also live in the Yukon. However, I was going to use the soil factory method because I find that with our 60 frost free days nothing breaks down very quickly. I am still finding jiffy pots from years ago before I knew better.